The Everest Tandoori Farnborough has been proud to provide the finest authentic Nepalese & Indian cuisine for the last twenty years. Our reputation is based on excellent and authentic food, excellent service and a warm and friendly atmosphere. Whether you are a visitor to the town on business or a regular, Sapan and the team look forward to welcoming you to our restaurant. IF it is a tasty curry with top service you are after, then take a trip to the Everest Tandoori in North Camp. The Lynchford Road restaurant has been proudly serving the finest authentic Nepalese and Indian cuisine for the past 25 years. 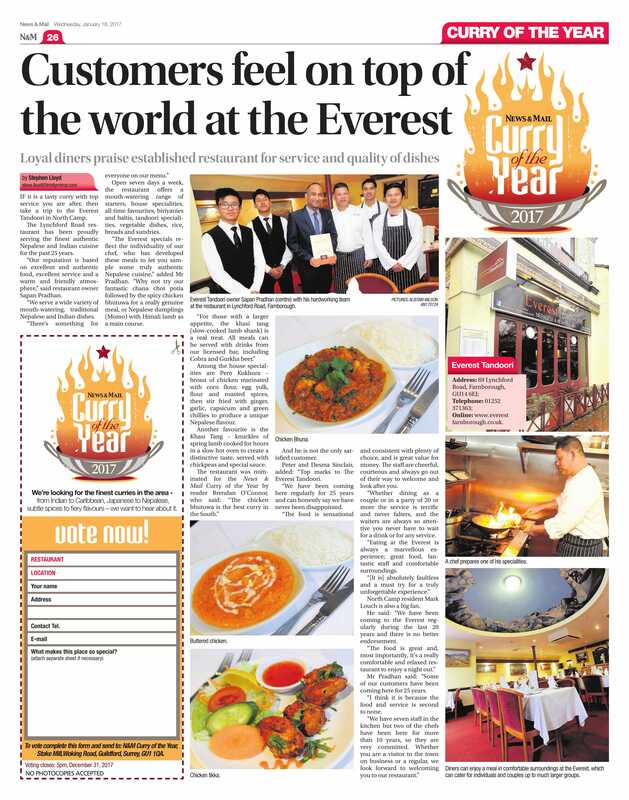 The Everest Tandoori Farnborough has been proud to provide the finest Nepalese & Indian cuisine for the last twenty years.